A few months ago, we were offered a set of white silkie chickens for free. They were living in a backyard in New Orleans and the rooster was crowing just a little too much for undercover urban chicken farming. I was happy to take them in after reading that Silkie girls are great mothers and will set on just about any kind of egg you put under them. 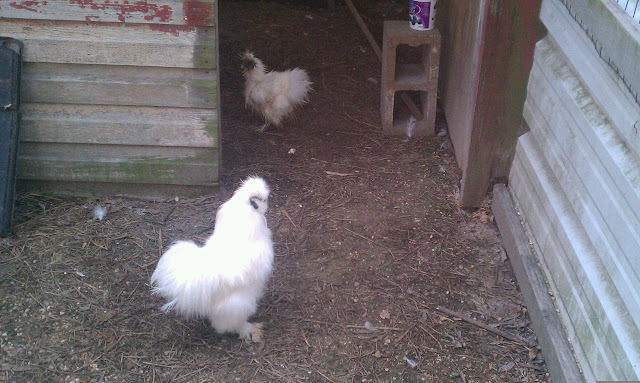 Since they were fancy, fluffy, white city chickens we decided to call them Bianca and Reginald. Reginald was quickly shorted to Reggie when we learned what a tough guy this cotton ball of a bantam thought he was, always doing this silly shuffle step display/dance that seemed to say "Put up ya dukes! I can take ya's!". We anxiously awaited Bianca's first egg, which after our years of duck egg collecting was adorably tiny. She laid for a few weeks then finally decided to go broody (stay on a nest of eggs). She only had about four of her own eggs in the nest so I carefully tucked a few duck eggs under her as well and hoped for the best. We stupidly didn't make note of the date she finally took residence on that nest so the last week or so we have been going in the pen and poking around under her in hopes of finding babies. A couple days ago, Big Onion walked in and found an empty shell in front of her. Like a proud new father he pulled out his cell phone to video the blessed event. The audio goes something like, "Hey, what cha got under there girl? Wait...what's that on your face....oh...OH...oh god..."
Turns out she ate one of the duck eggs. Didn't just eat it. She coated her whole face in rotten egg. When we checked on her today, we found the whole nest had gone bad. That is a smell I will never forget. There was rotten egg all over the nest and all over our beautiful white fluffball of a chicken. I carefully scooped her up brought her over to a nearby bucket of water and proceeded to try and bathe the dried rotted egg off one seriously pissed off little chicken. I've read that wetting a hen can also break her out of being broody. Big Onion dumped the entire contents of the nest into the creek. I'm sure the turtles will eat well tonight. I think the bath did the trick because when I put her back down she was going after food with a passion and starting to clean herself up. Reggie, for his part, was so thrilled to have his woman back he did his little shuffle step victory dance and fell over.